WE MISS YOUR, DEAR TEUNIS. Hi Teunis, congrats for the BIP, like the composition atmosphere, reflections and beautiful light. This will teach me to stay away for so long! Your beautiful award winning photo was posted on my birthday, and I missed it until now! As always, your work is inspirational Teunis, nature at its very finest presented by you. Thank you for your continued excellence here. OUTSTANDING photograph. Love the haze/fog and the colorful sunset behind it. 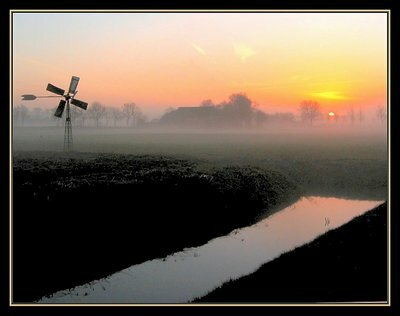 Windmill is fantastic, wonderful composition. And the strip of reflections draw you right in. You're still on holiday, till Jan. 14th I think you said.......see you when you get back! Very creative picture...;congratulations and Happy New Year my friend . Great color and composition. So cold yet so warm..:) Congrats. Awesome colours in this beautiful fantasy! I love it, your every shot is POWERSHOT! Its not often criticize your work Teunis but in this shot I think the water in the foreground adds nothing to the scene, Sorry, only seven out of ten. Spectacular colours and great landscape. Amazing sunset,really a superb picture,love its colours,congrats!!! Teunis, as always, this is a beautiful shot. Love the Mill and sunset! Thank YOU for visiting "Understanding Media"!!! Lovely and so moody dear Teunis! Great atmospher and beautiful colors. Superb picture. Very peaceful atmosphare. Beautiful colors! A mysterious landscape, with the mist! Nice Teunis, I love the way the tree's in the background still have light on them. Nice softness here here and I love the color tones.